Avast, me hearties! There's no need to go plundering for gold doubloons in Davy Jones' locker, because the land lubbers in Cupertino may have plenty to offer with the next iPhone. A helping of images emerged today thanks to Japanese site ASCII, with more popping up on AppAdvice too. The images purport to show a the iPhone 5S in a champagne colored cloak. 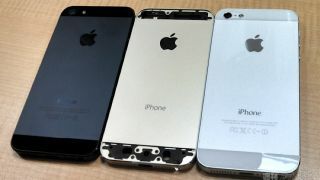 Several images slide the golden-hued next-gen iPhone in between black and white versions of the iPhone 5. To throw another kink in the rumor wheel, Mashable speculated that the phone on the right could be a hereto unheard of silver version of the iPhone 5S, but we're not really buying that. Of course, grab your salt shaker (or 24K gold flake shaker, if you prefer) as images can be easily faked, but the gold iPhone 5S rumor is certainly steaming full speed ahead. Although the latest round of leaked images seem to be quite convincing, the gold back shown above has a few minor differences worth noting. For one, the "iPhone" etching is done with what appears to be a thinner typestyle than the other models, which also include FCC markings and the telltale phrase "Designed by Apple in California" missing from the gold variation. Other high-resolution images published on AppAdvice show the same gold back, this time with an elongated hole next to the camera lens, again suggesting an upgrade to dual-LED flash with this year's flagship model. We could also be looking at the iPhone 5S in black next to it. Although several sources have confirmed a Sept. 10 date for the next iPhone unveil, Apple remains mum on the subject. Sit tight, but start saving your doubloons if you're looking to buy a new iPhone. Gold is a nice choice, but the Moto X has 2,000 different color combos you can create.